A purple toilet placed in people's yards as a fundraising tool and practical joke has been returned to its owners after a brief stint as a petunia planter. The toilet was being used by the Flushing Squad Relay for Life in Olean, N.Y., and was enjoying a successful run as a charity tool before it disappeared. The toilet was used as a prop for the American Cancer Society to help raise money. For a donation, it could be placed in the yard of a friend or neighbor, and another donation would cause it to be moved once again, noted the Olean Times Herald. The purple toilet, which is non-functional, by the way, began its journey in the yard of Olean Mayor Linda Witte, who played along with the good-humored publicity stunt. The funds raised from the toilet were going to support the American Cancer Society's Relay for Life on June 15. For a while, the toilet traveled from yard to yard and the charity gained money, but then tragedy struck. The toilet suddenly went missing. 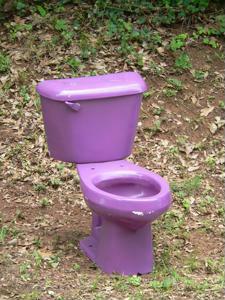 Many in the neighborhood suspected unruly teenagers to have taken or moved the purple toilet, but it turned out it to be a misunderstanding. A neighbor of someone hosting the toilet thought that the commode was a piece of abandoned construction equipment and knew exactly what it had to be used for: planting petunias. Unaware of his crime, the unidentified man kept about his business until news of the incident, reported widely in the town's newspapers and radio programs, reached him. He then returned the toilet and, given the nature of the unintentional crime, was pardoned by the mayor for his accidental theft. Using the purple toilet is one of many ways that the American Cancer Society recommends raising funds. According to the organization's website, "For $25 the Relay team will put a purple toilet on the yard of a person you choose. That person will then have the opportunity to 'flush' someone else ..." and so on down the line. Insurance for never getting the purple toilet is available as well for those who may not be as excited about the prospect. The site recommends the toilet as a great use for birthdays, anniversaries and for use as a fun gag gift any time of year. Understandably, the site also recommends leaving a letter explaining the toilet to the recipient.